“In the short-run, the market is a voting machine . . . but in the long-run, the market is a weighing machine.” Warren Buffett attributes1 this insight to his mentor, Benjamin Graham, the father of value investing. As 2017-Q3 makes way for Q4, some risks have abated as others are being swept into the market’s voting mechanism. Markets look forward, discounting expected gains by perceived risks. Indefiniteness about future outcomes is one constant risk. Personal opinions on specific topics aside, the relevant issue here is the probability of outcomes. With the end of Q3, some uncertainties have become certain, while others have become gristle for the market’s voting machine. Here are three examples. 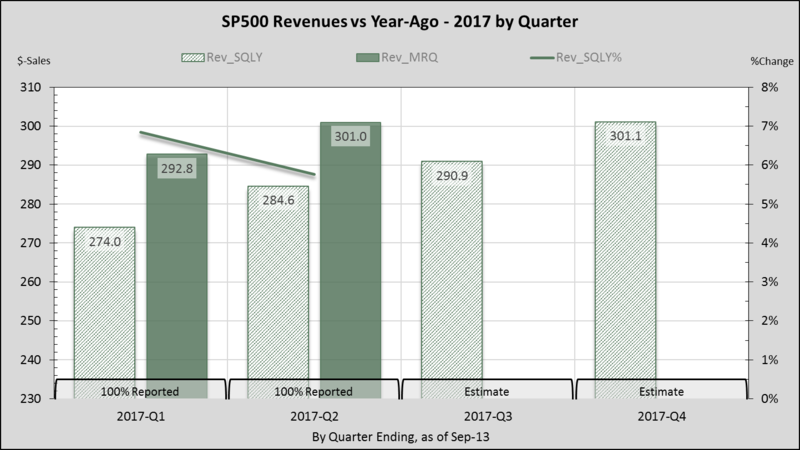 S&P 500 operating earnings for 2017-Q2 are in the books, recording 19% growth. October begins reporting for Q3, and expectations for Q4 of 15% and 25%, respectively. What exacerbates doubt about future outcomes? Rising comparative year-ago margins and sales are becoming increasing hurdles to growth, as shown in figures 1 and 2. 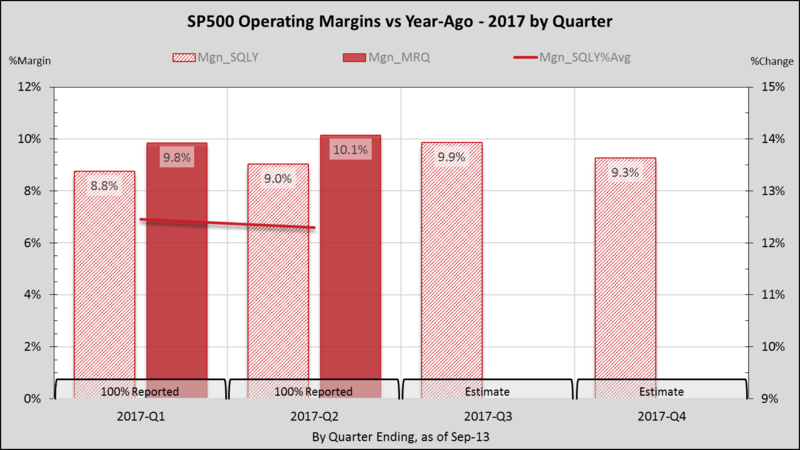 On average, sales growth decelerates in Q3, and margins drop about 5% in Q4. Sales and margins are drivers of earnings growth. Seasonality is another factor where incertitude has shifted. In the September Coherent Investor article, I discussed how September is the worst month of the year for stocks, while December is the best on average. But seasonality also depends on the longer-term trend. September’s curse having been skirted, December’s promise is bolstered by the current uptrend since February 2016. The debate on healthcare reform became a foregone conclusion on the September 30th budget reconciliation deadline. No longer needing to discount healthcare in Q4, investors can focus more attention on tax reform. Market reaction will be affected by what outcome has been priced-in. The market continuously adjusts its vote as facts change. Predictability is as much a factor in market behavior as the actual outcome of events. If the market truly climbs a wall of worry, then I would worry about the wall growing shorter. Published quarterly, the Manager’s Letter series primarily communicates the author and Chief Investment Officer’s personal opinion on the markets and other topics of interest to our clients. Buffett, Warren. “To the Shareholders of Berkshire Hathaway Inc.”, berkshirehathaway.com/letters/1993.html, 1 March 1994, accessed 1 October 2017. « Previous InsightWorst Month – September Or October?